It’s been a year since I climbed on real rock and six months since the accident. After lots of physio exercises, surgery and weekly sessions at climbing walls to remind my body how to climb, last weekend I finally got back to climbing outside. It brought a smile to my face and reminded me of why I love to climb. The accident was stupid. One of those seemingly minor things that have surprisingly big consequences. All I did was slip on some mud when walking in the Brecon Beacons. My right foot flew out from under me and I started travelling down the slope, but my left foot stayed behind. I ended up landing on my back with my left leg bent and twisted under me. After I picked myself up, I walked the three miles back to the bunk house with my knee making the sort of loud cracking noises it really shouldn’t make. It turned out I had torn the meniscus in my knee. The one, small advantage of having this particular injury was that I’d torn the meniscus in my other knee a few years previously and so knew what to expect. 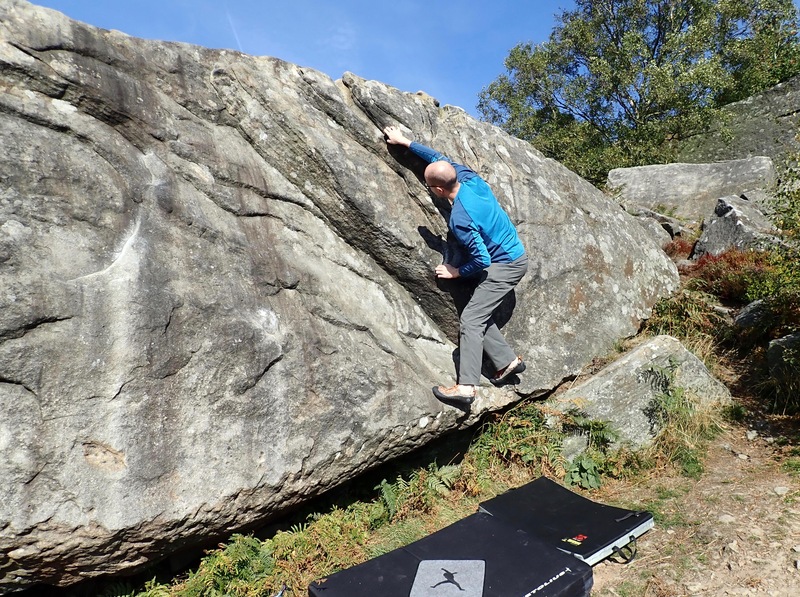 Me climbing Diagonal (V0- 4b) at Curbar Field. Six months later and I was ready to try climbing outdoors again. My plan was a gentle introduction involving easy problems, over good landings and backing off if a move felt like it would be too much strain on my knee. My hope was that the weather would let me climb at all as it feels like I get rained off a lot. In the end, the weather on Saturday was fantastic. 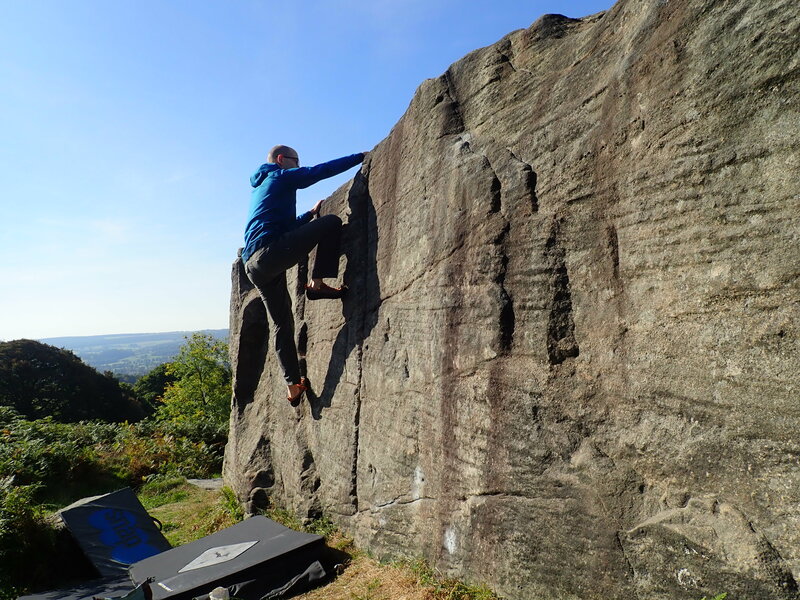 I climbed on easy problems at Curbar in the Peak District in bright sunshine. It felt good to be outside, working out moves, feeling the rock under my fingers, and putting in the effort to top-out. It also felt brilliant to complete problems that I didn’t think I would be able to with my rusty technique. 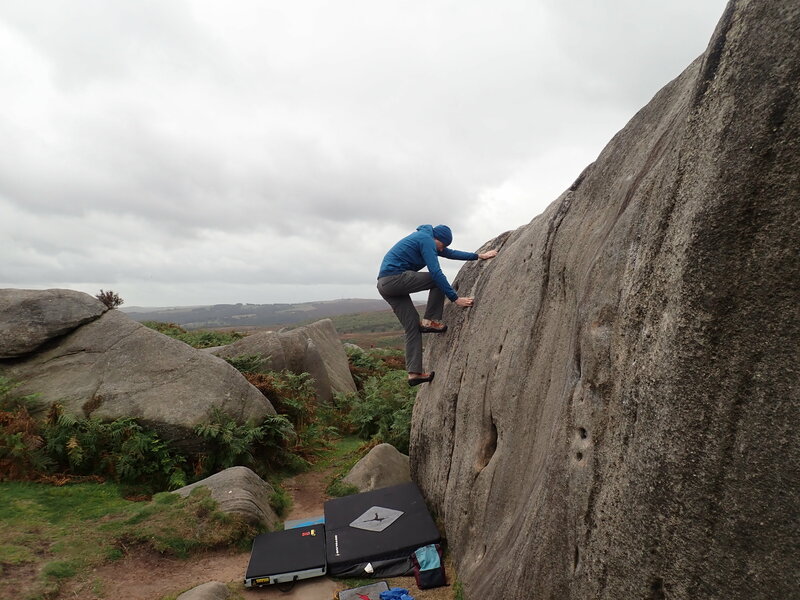 The next day I headed to Burbage South. The sun didn’t shine on me that day and I ended up giving up on a few problems that I could have done a year ago. However, I was pleased that I got up one challenging arete and did a couple of other tricky problems (albeit with a complete lack of elegance). 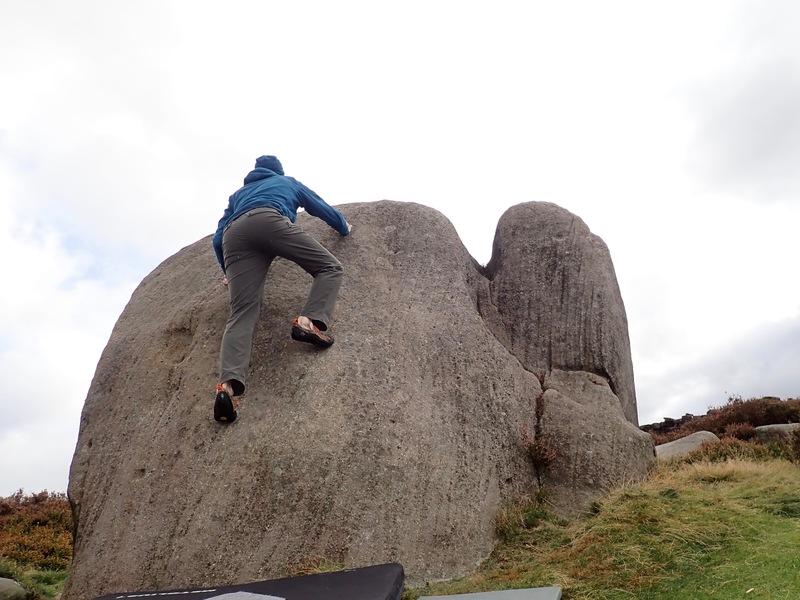 Trying to climb The Careful Trotter (V0 4c) problem on the That Little Piglet boulder at Burbage South Valley. The weekend reminded me that I have more to do to get back to where I was, but also why I’m doing climbing at all. Brilliant news that you’re back climbing again – horrible about the accident. I did similar once – I’d just got back from the Cuillin on Skye and slipped on mud while walking very fast and smashed my wrist in bits – needed pinning. It can happen oh, so easily! I have to say I was wondering where you’d got to! I’ve just had a hip replacement so I’m currently ‘off the road’ (well, the hills anyway – and not climbing obviously either). My hip had got bad enough to keep me away from actual crags last year and the year before anyway but I was still managing to climb at the local wall. Smashing your wrist sounds really nasty. It’s strange how little it takes to get hurt. Somehow it would feel a bit better to get injured dramatically (although, ideally, I’d like to avoid getting injured at all). I’m sorry about your hip. It’s got to be pretty frustrating. I hope you are able to look forward to getting out on the hills and crags soon. Very good to see these photos, Robin! Thanks John. I would certainly prefer just doing the lucky escapes.